The kora is a harp-lute. In the CD notes, the performer, Jali Sherrifo Konteh, tells how to make the instrument over a two-week period. It needs a large calabash sawn across for the resonator, with the skin of a cow as the soundboard, and one or two circular openings for soundholes. A wooden pole fitted into the calabash acts as the neck and three different thicknesses of nylon fishing line are used for the 21 or more strings. Plaited loops of cow skin tighten the strings against the neck to tune them. Two wooden rods protruding from the calabash either side of the neck allow the player to rest his hands while plucking strings. The instrument, unique to the Manding people of West Africa, is known to have a history dating back to the 18th century or further. The sound is well known. Indeed, there are a lot of kora recordings around. Those of Toumani Diabate on Hannibal, or of Dembo Konte, or the Rounder album of his father Alhaji Bai Konte, or the compilation from Ellipsis selected by Foday Musa Suso, Jali Kunda, are all respected. Here we hear Dembo's half brother, the youngest son of Alhaji Bai Konte. Sherrifo has made no recording that is readily available outside Gambia, and has not yet toured abroad. Sherrifo does play for tourists in the hotels, normally not for a fee but taking the proceeds of a collection, although he has yet to recruit any Western students. He plays locally, but the endemic poverty means his potential for breaking through are severely restricted. He has no money to raise funds to pay for a radio broadcast. Four years back he recorded a CD with the Kangbeng Band; he has not seen a copy, nor received any payment, although tracks have been played on the radio. So, this album makes amends - and I understand that profits from the CD will actually go back to Sherrifo, giving one very good reason to buy the album. 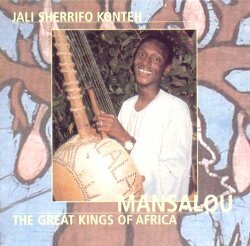 Most of the rival albums are studio recordings, but Mansalou: The Great Kings of Africa was recorded in the field. We hear live recordings, and the accompanying notes point out that intrusions, although fortunately rare, are minor since the birds in Gambia "sing as beautifully as the people". The kora as recorded here is beautiful and resonant, richly harmonic, with intricate melodic passages. Lengthy solo kora passages introduce and provide breaks from the stanzaic vocals. Sheriffo's voice is rather more brash, and takes some getting used to. The sound is more rough than most of the studio recordings, but this makes us feel closer to the village, and to the roots of the music. The album was compiled from three recording sessions. Different tuning systems were employed in the first two, one sowta tuning and the other-said to roughly correspond to the Western major and minor-siliba. One song comes from the third session, performed beneath a mango tree in the compound with the balafon (xylophone) player Suntou Kouyate. Some of the songs are new; some are treated in inventive ways. As the notes states, they are all performed with passion and commitment. The basic justification for the album, given in an article published in fRoots in May 2001 and here as Enthusiasm No.28, is the musician himself. Sherrifo, as I indicated above, has a great pedigree. He was photographed in his youth, for an article on his brother by Ian Anderson published in 1987 in Folk Roots 46. He comes from one of the most famous griot hereditary musician families. His great-grandfather, grandfather, father, and three brothers (Mamadou, Dembo and Bakiba), were or are all famous musicians. He has lived all his life in Brikama, a town associated with musician families. He dropped out from school in the sixth grade to concentrate on practising the instrument, and has worked everywhere a griot would, for naming ceremonies, marriage celebrations, birthday parties, for people returning from long journeys, and so on. Most of this sort of traditional work is declining, leaving the seasonal tourist trade. He hopes for better things. There is a problem: recording quality. Sherrifo was recorded with a single microphone on a portable minidisc recorder. Music archivists frequently lament the shortcomings of minidisc, in terms of its sample rate and clipping of sound. Once gone, sound cannot be recovered. Recent discussion has reiterated the general rule: minidisc recordings are not up to professional standards. This recording, then, is far from perfect. Further, a single microphone cannot hope to do justice to both a soft string instrument and Sherrifo's loud voice. Resonant kora passages are suddenly interrupted by the voice, with almost audible appeals from the electronic circuitry not to alter the volume so suddenly. It takes time to balance the two sound sources, the machine gradually adjusting its volume from one to the other. We cringe as we register the crackles and blotches of overload. I would humbly suggest we try to ignore this problem, though. On the plus side is Sherrifo himself. The two people behind the recording, Tina and Vic Smith, found him on their third visit to Gambia, a country they had fallen in love with. He treated them to extraordinary hospitality, took them around, and feasted them. At 27, he is, according to the Smiths, "clearly destined for a great future as a leading exponent of West African traditional music". By buying the CD you might just help him achieve this ambition, which is surely a small price to pay. Helping such a musician is more important than worrying about the recording quality, but please, please, give us better recordings next time!